Sometimes it is infinitely difficult (but not impossible) to escape the clichés. Recently we had this problem when we gathered our team for brainstorming for the annual “Back to School” campaign for Galleria Burgas & Galleria Stara Zagora. Problem #1 – How to generate a whole new idea by doing this campaign for the third time in a row? Problem #2 – What would be this brilliant idea that clearly will convey the message of the campaign, but at the same time will be far from the standard visuals and slogans where we usually see children, classrooms, painting tools, and so on? … It was looong brainstorming indeed. But as always, the answers appear when you ask the right question. And that question was “what problem exactly do we solve for our tormented parents?”. And here came our insight – we do not just give free backpacks to students from both cities, we undoubtedly help parents to tick at least one concern from the endless list and the overwhelming chaos that preparations for the first day of school bring. Yes, we do not solve all the problems, but proudly we can say that we can take care of at least one – the backpack! Creating the main visual for the campaign was definitely a complex task for our team of designers. Really, how do you visualize a non-material notion – getting rid of a care? 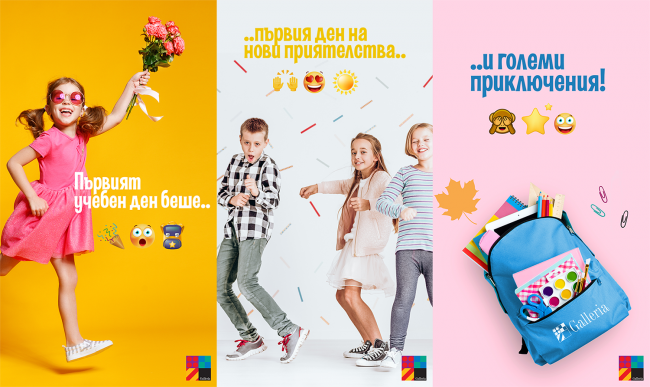 Thanks to our combined efforts and the good creative, the campaign was extremely successful – we did not even have to spend the entire advertising budget because many cares were ticked and the backpacks in Stara Zagora ended on the tenth day after the start of the campaign. In Burgas, the number of backpacks was twice as big, but we also achieved impressive results there too. In conclusion – we had a very good idea, created some great visualizations and reached over 34,000 users, successfully engaging over 8,000 of them. It was a fun and rewarding campaign. Alex believes in the magical power of words to transform reality. She says she’s a dreamer and visionary, but is aware that the world is changing when you take responsibility, roll up your sleeves and get the job done. She’s a PR graduate, but quickly realizes she’s a copywriter at heart. She likes to know all sorts of things on all sorts of topics, to delve into one’s thoughts, or in the books, or in the stars.